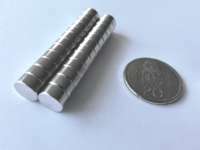 DangerousMagnets - C0804___Diam 8mm x 4mm. N45. Qty24 for sale! • 8mm diameter x 4mm thick. • Pull/Push: About 1.9kg to another magnet or to 1.2mm sheet steel. Resistance to sliding is about 1/3 that. • A good shape of magnet for mounting into a hole with epoxy glue. Better, jam in an undersize hole. • Clamp components while gluing. • Components for reborn dolls. • Educational: Magnetic fields - use with iron sand or iron filings.